Every enclosure and fuel tank we build is a custom design, but we’ve accelerated the normally slow process of custom manufacturing. To quote our founder, Dale Freeman, “We’ve taken a custom job shop environment, and turned it into an assembly line.” Freeman begins engineering based on release date, and runs parallel processes for tank and enclosure construction, often times prior to the arrival of the generator. All build stations at Freeman run simultaneously, reducing the production time on every job. At any given stage, we are able to coordinate between sales, project management, or engineering and the shop supervisors in weld, assembly, paint, final/electrical, and the tool room to provide real-time feedback to our customers concerning manufacturing progress, parts receivables, and projected completion dates. Our experienced Sales & Project Design team is capable of providing detailed specification review, design-build assistance, detailed quotations, and submittal drawings in a timely manner. The Accounts team is readily available to coordinate project information with you and your equipment suppliers. After release, we offer on-site services including assistance with delivery, installation, and training through our skilled team of field service technicians. We proudly offer facility tours and are happy to host you and your customers for design collaboration meetings, quality & safety audits, in-process or pre-release source quality control review and testing. 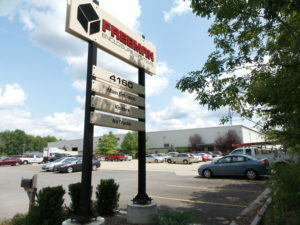 Above all, Freeman Enclosure Systems stands behind our products. We match most generator manufacturers’ standard warranty periods, terms, and conditions up to two years and we offer extended warranty options as well.